Hi everyone. 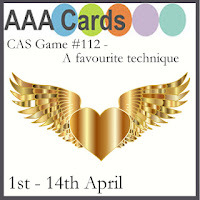 Today is the start of the CAS Christmas April Challenge. This month the challenge is hosted by my sweet friend, Bonnie (Stamping with Klass). A few months ago, my friend Nancy mentioned about a new technique she had tried called Faux Enamel. I wanted to give it a try, so I followed this video. I was hooked and have been merrily making all sorts of faux enamel pieces. It's a great way to use up old embossing powders as well. The faux enamel ornament was made from a chipboard circle coated in different colours of embossing powders (silver, red, white, snowflake tinsel), placed on a warm grill. Once they started to melt, I used a palette knife to mix the colours a bit. I kept adding more embossing powders until I was happy with the look. 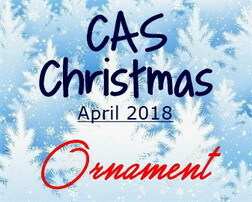 Our challenge today is to create a CAS Christmas card featuring an ornament. Any type of ornament --- plain paper, patterned paper, dry embossed, stamped, mixed media, etc. Any style (as long as it's clean and simple) is welcome! Please check out the challenge blog to see the gorgeous Ornament cards from our very talented designers, then come play along. The challenge is open until April 24th! See you in the gallery! 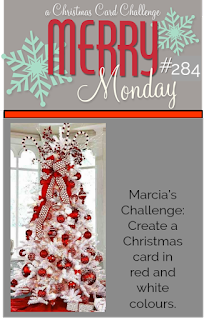 I'm entering the above card in this week's Merry Monday's challenge (#284 - Red & White) that is being run by my dear friend, Marcia. Neutrals are allowed. Loll, what a gorgeous card and ornament. So elegant. So glad you were able to play along this week at Merry Monday. Stunning faux enamel ornament, Loll - just love all the swirled colors!! Perfect in the stitched window with the stenciling behind! So glad you could join us at Merry Monday!! WOW! that looks so EXPENSIVE!, I love it. WOW! This is exquisite! Love your choices of powders and enjoyed the video link from Nancy too! I'll have to try this. The red and silver is so elegant! This is one of my favourites of your recent cards, Loll! Such a beautiful blend of red, white, and silver on the ornament - and great bit of stenciling behind it. Looking forward to doing more with this technique some time. Wow! This is super, Loll. I love your ornament. Thanks for joining in at AAA Cards. A stunning CAS card with a gorgeous Faux Enamel ornament, Loll! 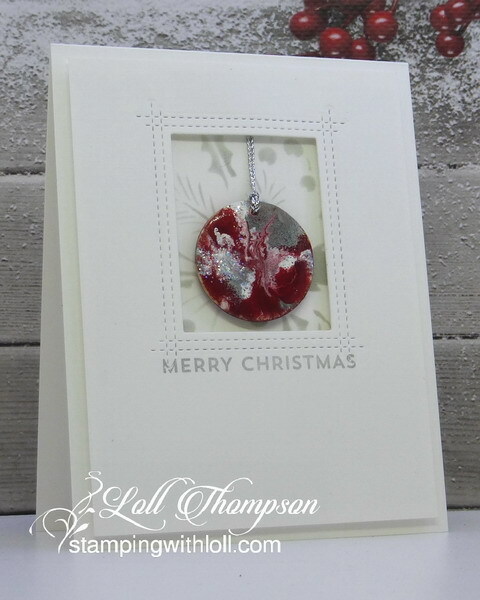 I love the beautiful color combination(with the shiny snowflake tinsel), and the way you mixed the embossing powder! The faux enamel looks amazing! Love the dark moody reds and the touches of silver. Quite spectacular! Thanks for playing along with the favourite technique challenge at AAA Cards. You are so talented, Loll. I just adore that you like to try new techniques. Well, maybe not new, because this sounds familiar to me, but new as in it's fresh and different from the current designs being shared. I adore your take on this. What a beautiful ornament and a lovely card on which to present the ornament. Thanks for sharing. Hugs! Love this beautiful card, Loll. The faux enamel ornament in the window is stunning with the lightly stenciled background. Enjoy your day! I can hardly wait to try this. Thank you, Loll, for discovering this technique and then sharing it with your admiring followers. Beautiful faux enamel ornament. Love the colors and the way you framed the pretty ornament. The stenciled background is perfect behind the ornament. Love all the texture and dimension. Thanks for sharing with us at Merry Monday. Wow, Lol, this is stunning! I am going to check out this video, but I bet mine will not look like yours! *wink! thank you for joining us at Merry Monday too with this fabulous card!! OMGosh Loll this is one outstanding design here. You have created something so simply beautiful. Love the new technique you mentioned and you have wowed us here. Love the touch of grey, background and your peek a boo die. That red just POPS! Loll, I love that you are never afraid to try a new technique--as we ALL benefit! Love the stenciled background!! Yes, embossing powders are fun...can wait to try THIS technique. Loll...absolutely love your card! Am off to watch that video...thanks for sharing. Love this, Loll. Very cool ornament. This ornament is GORGEOUS, my friend! I love the mix and pattern of your colors! I also love it on the stenciled background and framed so prettily! I was entranced by the video, Loll. I saw Jennifer McGuire do something similar with her heat gun. Too bad I don't have more colors of embossing powder. The colors on yours a perfect for a Christmas ornament. Loll, Stunning and I can't wait to try this technique. Thank you for joining us over at Merry Monday. Wow! The faux enamel is really beautiful. I can't wait to try it. This made for a stunning card! Thank you for sharing! Stunning card Lol, and what a beautiful technique. So happy you joined us for Merry Monday this week. This is stunning. That ornament could pop out of that card and go right on your tree. Love it. Stunning Loll, love this idea and what a brilliant idea for using up those powders that are not so crash hot any more either. Looks absolutely wonderful. Your ornament is amazingly beautiful, Loll! I love how the colors mixed together to create a shiny layer. Great technique. And I must add that the background in the window emphasizes the ornament so well. The use of silver ink for sentiment is a brilliant idea. Your ornament is stunning, Loll! Love your overall design too. Thanks for sharing at AAA Cards challenges. Hi Loll, sorry been missing in action much of this month, I am loving the new Christmas challenge...only just made it this month though!! Whew!